Astell & Kern KANN Portable Hi-Res Music Player. Available with Online Finance and Free Delivery. KANN is here to lead the portable high-res audio industry to a whole new level. Astell & Kern’s experience with technology and portable devices makes it possible for the KANN to offer dynamic power and performance. 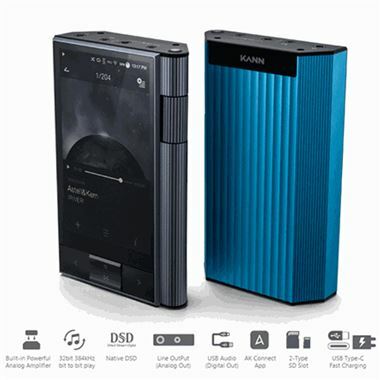 KANN is the complete all-around portable high-res digital music player with powerful output and studio quality sound. KANN cleverly incorporates a high-performance amplifier into a player for a perfect merger of two independent devices. Supporting the output of 7 Vrms when connected via high-gain balanced output, the KANN not only drives high-impedance headphones without an additional amplifier, but also reliably reproduces high-quality sound with low-impedance speakers. The first Astell & Kern product to be equipped with a line-out circuit designed to set the output values in 4 levels, depending on the user's listening preference. This feature is a significant step up from previous products which did not provide output/volume control. With the selectable output function, you can fine-tune your sound to suit a home system, car audio or any other listening environment.